The auto maker doesn&#8217;t expect North America operations to be affected, but Asia/Pacific plants could be forced to cut production. 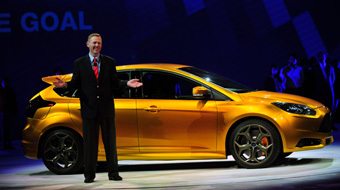 DETROIT – CEO Alan Mulally says it is unlikely Ford will experience any production disruptions in North America due to parts shortages from the earthquake and subsequent tsunami that struck Japan March 11. Speaking to reporters after receiving the 2011 Automotive Executive of the Year award from DNV Business Assurance here, Mulally says the situation still is unfolding, but warns disruptions could occur at Ford’s Asia/Pacific operations. The executive says Ford has been working closely with its supply base to come up with alternatives in the event parts shortages occur. If U.S. production is disrupted, Ford will be “transparent” about the situation. The situation is “very complicated” for the entire industry, Mulally says, noting “the supply chain is everywhere. “On one hand, we’re finding solution after solution as far as making things better, but also we’re still on a journey of discovery on some of the parts,” he says. Meanwhile, Mulally expresses confidence a mutually beneficial deal can be reached in contract negotiations with the United Auto Workers union later this year. At the 2011 UAW Bargaining Convention last month, President Bob King slammed Mulally for receiving millions in salary and stock rewards while the union continues to make sacrifices. Mulally says Ford pays for performance and notes the auto maker has posted seven consecutive profitable quarters. Mulally says relationships also remain strong between the auto maker and its Lincoln dealers, some of which have struggled to turn a profit following the discontinuation of the Mercury brand last year. Lincoln’s product lineup currently is in a transition period, he says, noting it takes a few years for new vehicles in development to reach the market. The Lincoln brand largely was neglected as Ford focused resources on its former luxury marques Jaguar, Land Rover, Volvo and Aston Martin. Now that the last of those brands has been divested, the auto maker is concentrating on reinventing Lincoln, Mulally says.